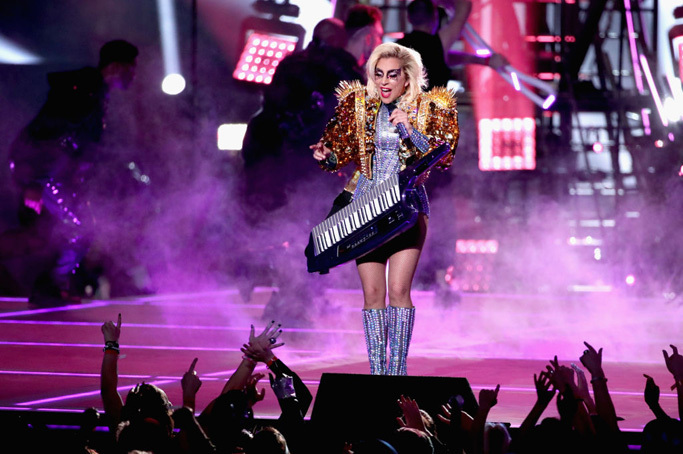 For her epic 12 minutes halftime show during the Super Bowl on February 5th, 2017 in Houston Texas, Lady Gaga chose to wear a series of custom-made Atelier Versace looks. She later topped her look off with a custom-made, Atelier Versace cropped gold jacket fully embroidered with Swarovski accents and accentuated with armor-like shoulder pads, topped with a cluster of dramatic gold spikes. For her final set, the singer wore another custom-made, Atelier Versace look, this time rocking a pair of fully embroidered hot-pants and cropped sculptural white jacket, made of a special silicon material with metallic hardware details and coordinating Swarovski crystal accents.